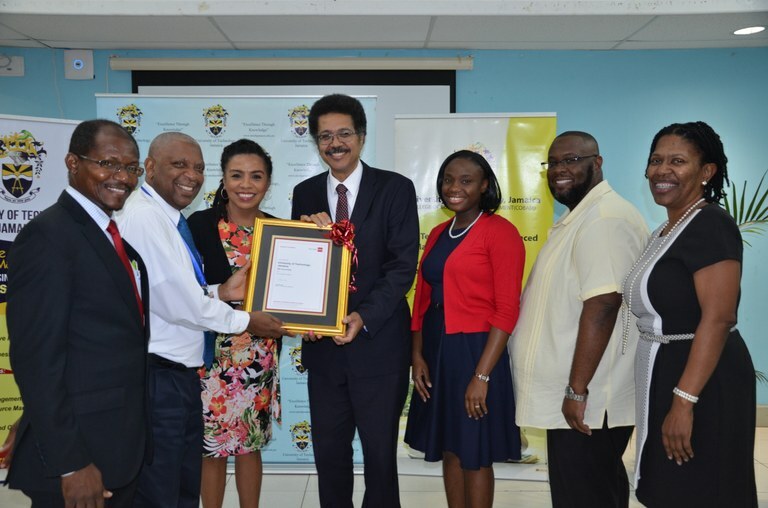 UTech, Jamaica’s Accounting Programme Receives ACCA Exemption Accreditation — UTech, Ja. Professor Stephen Vasciannie, CD, President, University of Technology, Jamaica accepts the Association of Chartered Certified Accountants (ACCA) Exemption Accreditation certificate from Mrs. Maria Sookdeo, Business Development Manager, ACCA at a special ceremony hosted by the University at its Papine Campus on Thursday, January 25, 2018. The University of Technology, Jamaica has been granted Association of Chartered Certified Accountants (ACCA) Exemption Accreditation for up to a maximum of nine specific modules at the ACCA fundamentals level now accessible by graduates of the Bachelor of Science in Accounting programme offered by the University’s College of Business and Management. Graduates of the programme will therefore only be required to sit the professional ACCA examination. The academic milestone was announced at a special ceremony hosted by the University at its Papine campus on Thursday, January 25, 2018. 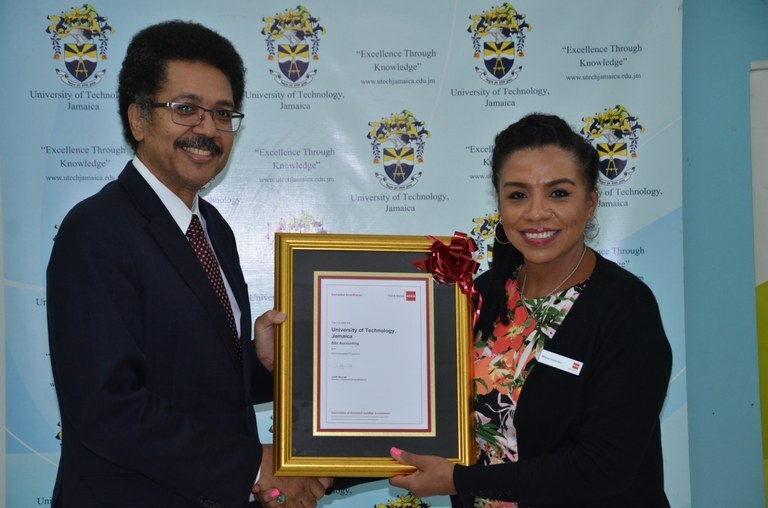 The ACCA Accreditation Certificate was presented to UTech, Jamaica President, Professor Stephen Vasciannie, CD by Mrs. Maria Sookdeo, Business Development Manager, ACCA. Professor Vasciannie thanked all persons who have contributed to the fruition of the signal achievement, led by Professor Paul Golding, Dean, College of Business and Management. Prof. Paul Golding in applauding the ACCA validation of the University’s Accounting programme, pointed out that UTech, Jamaica is one of only two Universities in the region to receive the ACCA exemption accreditation status for its accounting programme. He commended the leadership of the School of Business Administration (SOBA) led by former Head, Mr. Clavery Allen, now Associate Dean, Undergraduate Studies (Acting), Miss Celia McKoy, Acting Head, SOBA, Mrs. Deonette Lambert, Associate Head, SOBA, Mrs. Danielle Sawyers –Brammer, current Programme Director, Bachelor of Science in Accounting, Mrs Joan Lawla, former Head, SOBA, former Programme Directors, Mr Errol Branford and Mr. Lorence Brown, and lecturers, Mr. Kerwin Hamil, Mr. Roger Brown, Miss Michelle Thompson, Ms. Jacqueline Samuda, Ms. Majorie Clarke, Ms. Pat Roberts-Brown, Ms. Collette Folkes and Mr. Michael Nicholson. Mrs. Sookdeo noted that the ACCA’s partnership with UTech, Jamaica can facilitate more opportunities for its students through the development of initiatives and special offers that can assist accounting professionals to embrace the finance arena sooner than expected. She took the opportunity to invite current UTech, Jamaica accounting students to register for the ACCA Accelerate programme which gives students the opportunity to register with ACCA while they are still doing their degree. UTech, Jamaica students will benefit from access to special rates and discounts through the ACCA Accelerate programme. UTech, Jamaica and the ACCA in 2015 signed a Memorandum of Association which offered both organisations the opportunity to collaborate on areas of mutual benefit. The ACCA is the world’s leading body for professional accountants with more than 20,000 qualified members and 486,000 students world-wide. Prof. Paul Golding (2nd left), Dean, COBAM and Prof. Stephen Vasciannie (4th left) show off the ACCA Exemption Accreditation certificate. Joining in the happy milestone occasion from left are Prof. Colin Gyles, Deputy President, UTech, Ja., Mrs. Maria Sookdeo, Business Development Manager, ACCA, Mrs. Deonette Lambert, Associate Head, SOBA, Mr. Clavery Allen, Associate Dean, Undergraduate Studies (Acting), SOBA and Miss Celia McKoy, Acting Head, SOBA.